This "Best Route" is a 6 day leisurely trip averaging 200 miles/day. to spend 2 nights at most stopovers. Find Trip Summaries with typical costs on our Home Page. 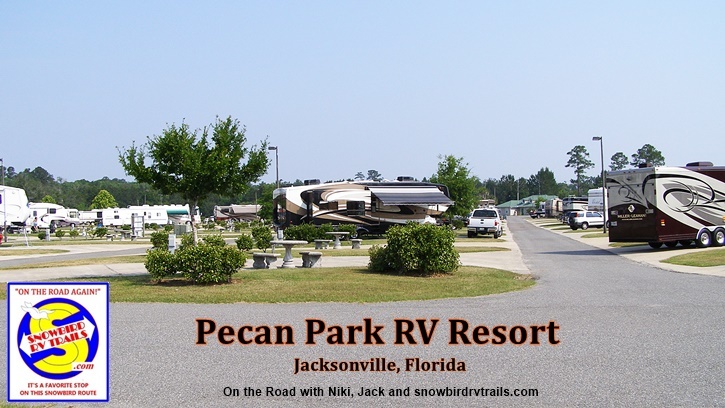 One of the nicest Passport RV Parks on the route! This Park has 70' x 40' level concrete pull-through sites that will accommodate the biggest, big rigs easily. The campsites have full hookup, a picnic table, and free WiFi. Who could ask for more, the weekend Pecan Park Flea & Farmer's Market is as close as walking through the opening in the fence that surrounds the RV Park. is only 6.5 miles away. Tours start every 45 minutes from 10:00 am to 4:00 pm. We strongly recommend a visit if you have the time. I-95 – Exit 366 (Pecan Park Road) – Head west less than ¼ mile on the left side. Located 6 easy miles off I-95 - we like it because it is out in the country - clean, quiet, peaceful and run by nice, friendly people. Becky owns the place and is always making improvements. She also raises champion Boxer dogs. They have pull-throughs, 30 Amp, good water, a dump station, propane and laundry facilities. Jolly Acres is usually nearly filled to capacity with Snowbirds during the Winter months but call ahead and Becky can normally fit you in for a night or two. Mayberry Campground is located on a part of the former 2,000 acre farm belonging to Chang and Eng Bunker, famous Siamese twins of the 1800’s. The twins – forever conjoined – had a prosperous farm as well as 2 separate and prosperous families. They married 2 sisters and had 21 children between them. They kept 2 separate homes, alternating 3 days at each home. 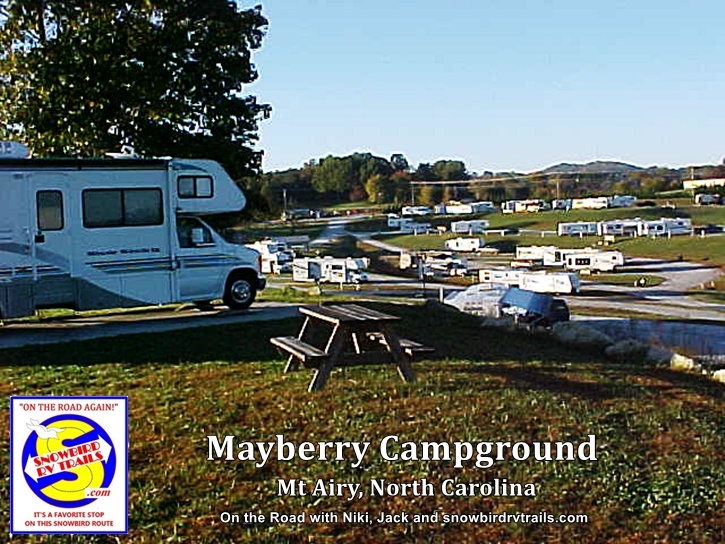 Mayberry Campground has over 100 gravel sites with both back-ins and pull-throughs, full hook-ups, 30 and 50 Amp, free WiFi and free TV cable at every site. There are 2 catch-and-release ponds (no fishing license needed) and the Bunker homestead on the property that features tours on some weekends. We have enjoyed dinner at “The Copper Pot," 123 Scenic Outlet Lane, Mt Airy (336) 352-4108. Real Southern home-cooking served by cheerful ladies with North Carolina accents so thick you almost need an interpreter. Good food and Great people – the feeling is real hometown friendliness. We also tried a new lunch spot suggested by the campground and backed by many good reviews on the Net. It’s called "Little Richard’s Smokehouse BBQ," 455 Frederick St, Mt Airy (336) 783-0227. We like BBQ and have sampled it in nearly every State East of the Mississippi. This place is our new favorite for BBQ done right. Tender and juicy – slow cooked over hickory coals for 16 hours and truly finger lickin’ good. The sides are homemade as well. For sides we both tried the mac & cheese and turnip greens accompanied by a large basket of hush puppies. They have a soft drink – new to us – called “Cheerwine” which is cherry flavored and also tasty as were the warm blackberry cobblers we had for dessert with vanilla ice cream (of course!). We can also recommend Tlaquepaque Mexican Restaurant & Grill at 2123 Rockford Street. It’s a small restaurant with a talented chef. Both of our meals, traditional Mexican combos, were really delicious. There is much to see and do in Mt Airy, the birthplace of favorite son - Andy Griffith. Visit Andy Griffith’s “homeplace” at 711 East Haymore Street. Less than a mile away you’ll find “The Snappy Lunch” still making the “famous pork chop sandwiches”. It’s next door to “Floyd’s Barbershop” and “Opie’s Candy Store.” Just a little farther down Main Street you’ll find “Wally’s Garage” and “The Courthouse” with a recreation of the jail set office and cells we remember from The Andy Griffith Show. That’s also the place to sign-up for an “Andy Griffith Squad Car Tour” of Town in a vintage Mayberry Police Car like Barney and Andy drove. Not far away you’ll find the “Andy Griffith Theatre” and the Andy Griffith Museum where they have hundreds (perhaps thousands) of artifacts and memorabilia from Andy’s career on stage, TV and in the movies and as a singer and comedian. The Museum’s lower level has an exhibition of material from Eng and Chang’s life as well. A convenient stopover just off I-81. The sites are gravel pull-thrus with 50A and FHU. They will honor Passport America for one night only - and not on weekends - and no other club’s discount if you plan to stay more than the one night. They have a small cafe on site but we've not used it. 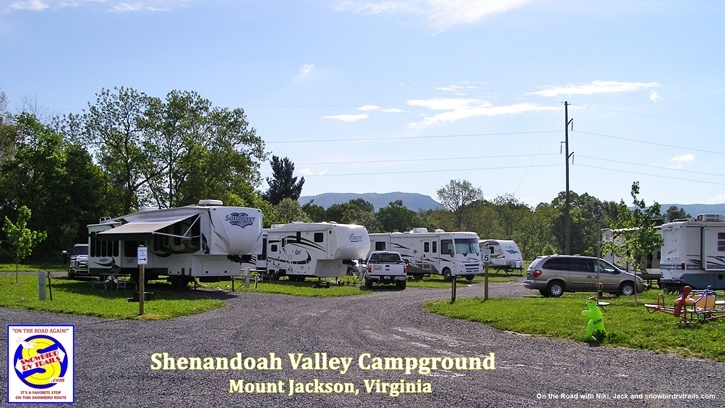 The campground is convenient to Shenandoah Caverns, a local weekend flea market and the Route 11 Potato Chip Factory which we have enjoyed visiting. We have also made a day trip from the campground to travel part of the Blue Ridge Parkway and a visit to the Shenandoah National Forest. It makes an interesting loop starting East of New Market and exiting the Blue Ridge Parkway at Front Royal and then back to the campground. There is a smaller gas station at this Exit but a larger Truck Stop at Exit 267. The Denny’s at Exit 267 serves pretty good food. PA $26 - PA Valid Sunday through Thursday. Reservations preferred. Open year-round. 233 total RV sites, can accommodate RVs up to 40ft, 30/50 amp service, full hook-up and partial hook-up sites. Pull-thrus, Cable TV. Exit 23 and go south for about 100 yards and turn right (go west) on old route 22. 1.26 miles from exit 23. Notes: The campground is close to the Interstate (I-78) as the crow flies but a bit circuitous by RV. It's a winding path of narrow back roads to get there but doable for any size RV. 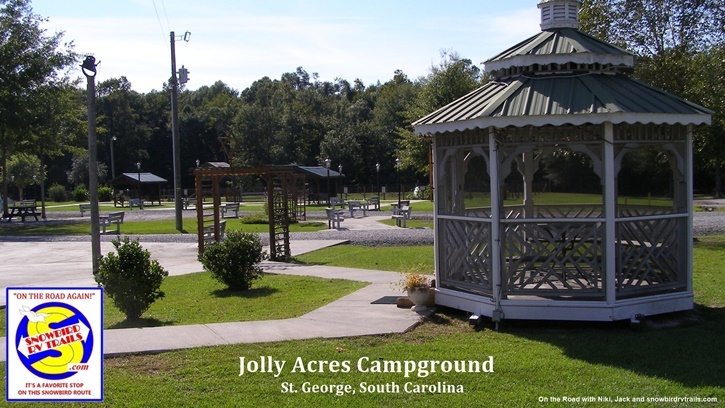 The campground home page states cable TV, WiFi and a full service restaurant. We used our antenna which was more than adequate. Local WiFi service is non-existent. The restaurant is only open on weekends. The next morning I visited the "Hostess" in the office to inquire about my misconceptions. She told me that "the WiFi is only receivable near the office area"
Pennsylvania Dutch Campground is a Passport America campground and offers half-price camping Sundays through Thursdays but it costs *$3 additional charge for 30/50 Amp, pull thrus, Direct TV and A/C & electric heat. There are many PA campgrounds that we have visited which are nice and totally satisfactory and a great value at half-price. This campground is fine for a night or two. WiFi at this campground is weak at best. Cable TV excellent. Hyde Park is about 1/2 hour away. The famous site of the '69 Woodstock Festival and Museum is close-by and there is also a train into NYC about 45 minutes away. Also interesting are the Saugerties Lighthouse and the Main Street in Catskill with their cat sculptures. Lots of little shops in the town, great places to eat - even a movie theater. Toll charge (Class 4H/4 axles) - Albany to Saugerties $8.25.